I like the way the English do things. Their speech, mannerisms, and courteous ways, especially with their nautical customs steeped in history as they are, are all done with just the right amount of—well, as their neighbors across the channel would put it, sang-froid, cool, self-assurance. “M’Lord, it’s the Spanish Armada. Shall we dispatch them?” “Straight away, Commander, at your leisure. Another example is the little radio exchange I was part of as we were leaving our berthing space whilst sea trialing the Fairline Squadron 74, the British boatbuilder’s new flagship that seemed to me to be a quite proper cruising vessel. 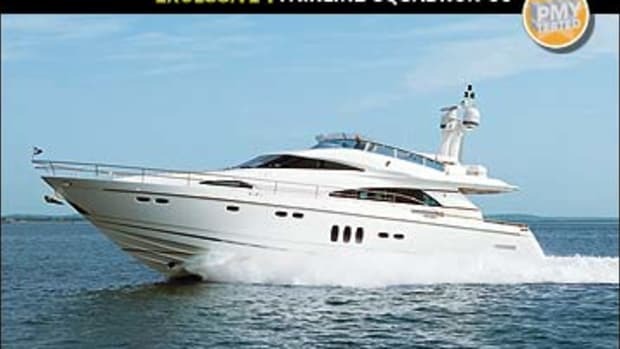 “Fairline 74, this is QHM, over,” came the precisely pronounced answer. It was all well done. 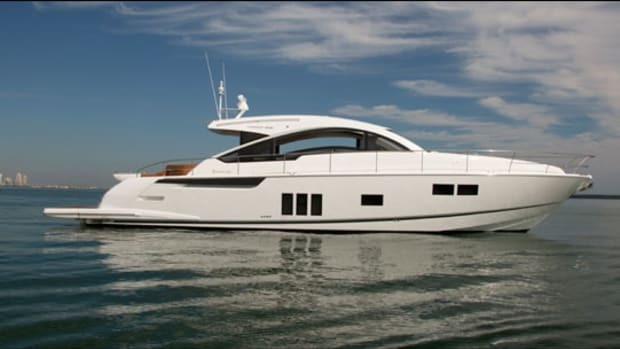 Something else done well is the way Fairline builds boats. I make that assessment based on my firsthand experience a few years back with our company boat, a beautiful Phantom 43 that I spent several pleasant weeks on during her six-month stay with us. 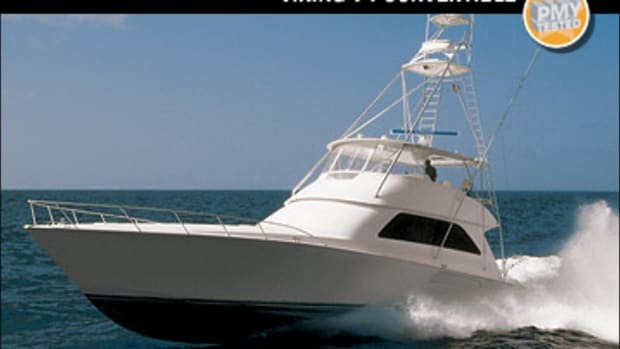 I found her to be a comfortable ride for my family and me as we visited many ports on our summer travel schedule. 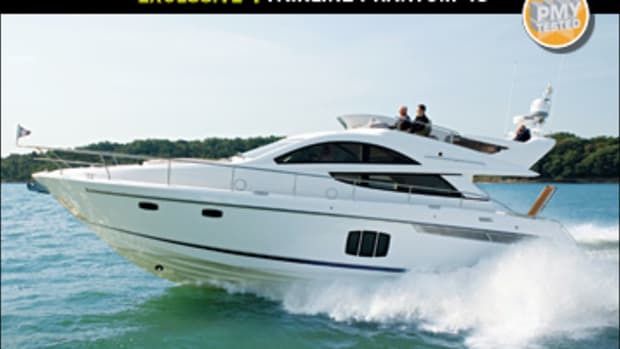 After a day aboard the 74, I could see that Fairline hasn’t lost its touch. Take, for example, our test boat’s stunning woodwork, a combination of burr elm and eucalyptus that provided an eye-catching design element throughout, including the four staterooms below decks. (An optional three-stateroom layout includes a pair of walk-in closets in the master stateroom and a fully en suite head in the guest quarters.) Whether in the saloon, starboard dining space, port galley, or starboard helm station, the fit and finish and joiner work was superior; grains matched perfectly. The layout on our test boat included a forepeak stateroom, a pair of twin berth quarters to either side, and an amidships master. Each has ample stowage areas including drawer, cabinet, closet, and cubby space to make packing for that long weekend or extended excursion easy. Design elements like the sculpted overhead in the master, the meticulously finished wood bulkheads in the hallway, and the wooden blinds in all the quarters add to the classy ambiance. Noteworthy interior design continues on the main deck, where Fairline has created a space meant for entertaining and emphasizing ease of movement. The main deck is a comfortable yet elegant space not only pleasant to look at but easy to move about in. 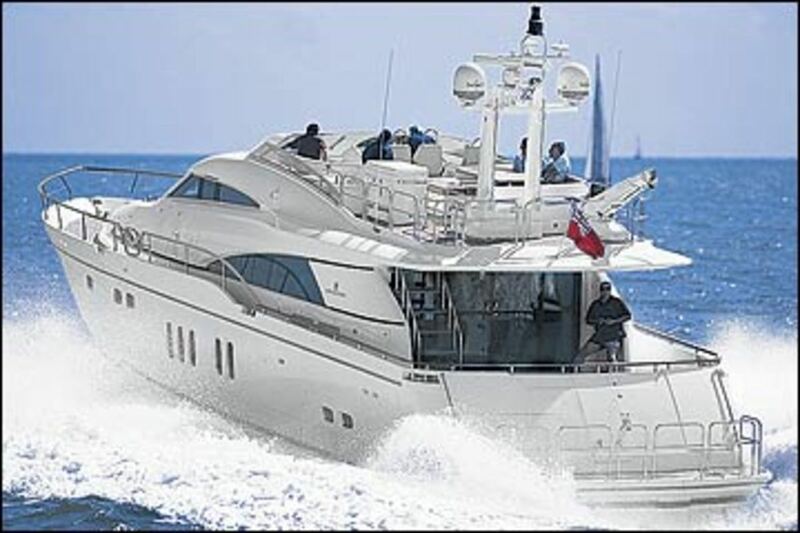 To starboard is the fully equipped helm, with its twin multidirectional, electrically adjustable Recaro leather chairs. While comfortable, I found they were too low for a good view of the water ahead, even on the highest setting. I had to sit up straight, which I imagine would be fatiguing after a while. To port is the optional breakfast nook complete with granite countertop and a pair of stylish stools. Other possible configurations here include a nav station and a dual companion seat. The dining table, just aft of the lower helm station, can seat eight. The galley, opposite the dining area, has an electrically operated partition that can close off the cooking and prep space when necessary. 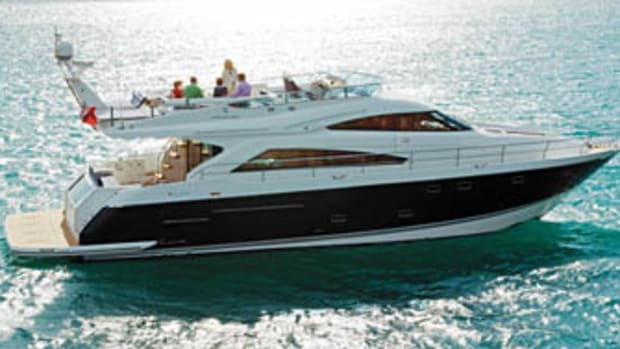 Combine that with the shoji-like sliding door that can separate the lower helm station from the dining area, and a dinner aboard takes on a special, private quality. 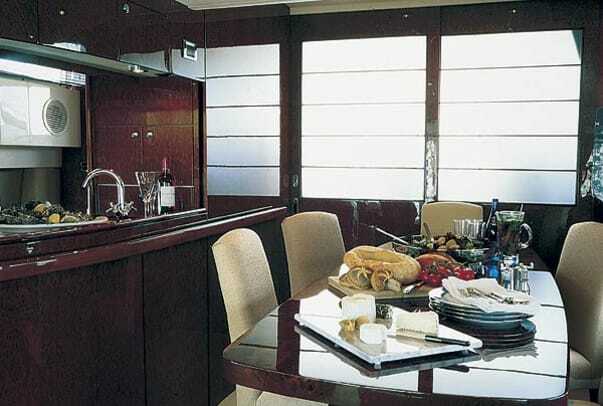 Aft of the dining area is the saloon seating area, with a leather couch to port and a pair of leather barrel chairs flanking a hand-crafted credenza to starboard. It holds a 30-inch plasma-screen television, which quickly and silently rises and disappears, as well as a bar with refrigerator. But the 74 offers more than just exceptional design and accoutrements. 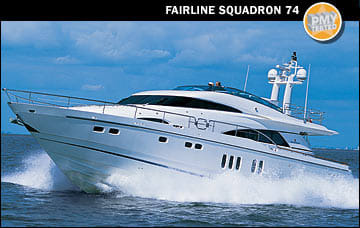 Fairline made sure the 74 is well-equipped, too. With the flip of a switch, half of the integral, teak-soled swim platform raises to reveal the transom garage, which houses the optional jet-drive RIB tender. The platform itself is surrounded by a rail for safety, and I was impressed by its strength. In fact, I was impressed by the quality of all the hardware aboard, including the standard Lewmar warping winches in each cockpit corner. Access to the stand-up engine room is through a gasketed door in the transom that is located on the vessel’s centerline just to starboard of the garage. The door is hinged on top and secured by two large latching dogs. It also rises and lowers on gas-assisted rams, as do all the hatches, for easy and safe operation. The engine room itself is work-friendly, as both inboard and outboard sides of the engines—on my boat, a pair of 1,400-hp Cat 3412E diesels—are easily reached. Sure to be a focal point for any cruising party is the wide-open, teak-sole bridge deck. The pilot’s and co-pilot’s seats are flanked by seating areas, while a dining table and additional seating is located aft of the starboard side helm. There is a grill aft of the port seating, room for an optional Besenzoni davit on the starboard side of the bridge overhang, a sunpad, and a rail surrounding the aft section. Opening that grill top proved rather difficult as it’s quite heavy, and I found myself wanting to get my fingers out of there in a hurry while lowering it. A handle and perhaps more substantial rams than those already on it would help. My test boat’s performance was also impressive. 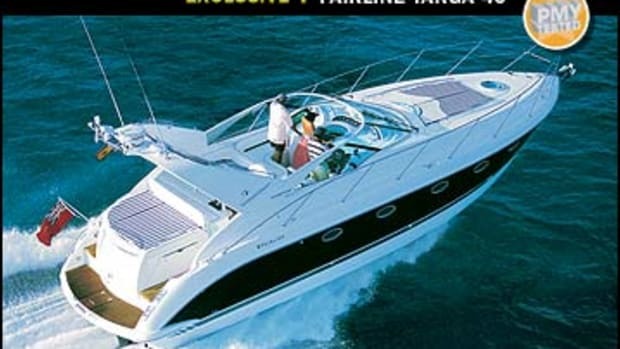 While the Solent was relatively calm, Fairline’s delivery captain assured me that: “We had been through quite a stink coming down and were still able to maintain 20 knots.” Our boat answered the helm quickly as I threw her hard-over during WOT runs and carved several 360s. I noticed an rpm drop of perhaps 100, a sign of good hull design, and when I let her go on her own, I watched her track straight and true. 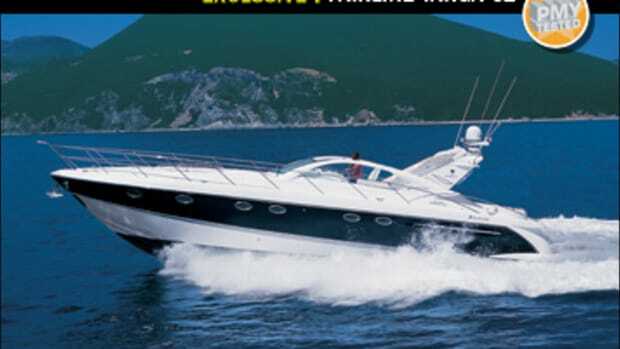 At 2000 rpm I calculated a 30.4-mph average with a 308-NM range, good for a boat with a fuel capacity of almost 1,300 gallons. Docking was easy thanks to bow and, on our test boat, the optional stern thruster and an optional remote control device that allows docking from a plug-in station in a cabinet located on the starboard side of the cockpit. This neat gizmo controls both throttles and thrusters. 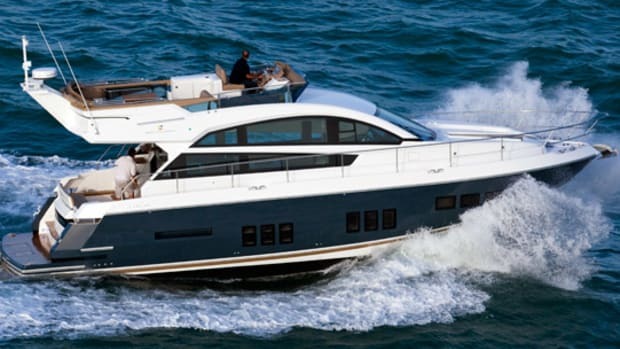 The 74 is easy to look at, with her low profile and distinctive windows. (There are five verticals on either side.) However, there is a lot more to her that lies in places not easily seen. Her props are in tunnels to reduce both draft and shaft angle, and 3M Thinsulate is used throughout, including between the engine room and the liner for not only sound attenuation, but thermal insulation as well. The decks are polyurethane foam-cored for strength and thermal insulation, and transverse and longitudinal stringers as well as molded-in engine bearers make her a soundly built vessel. 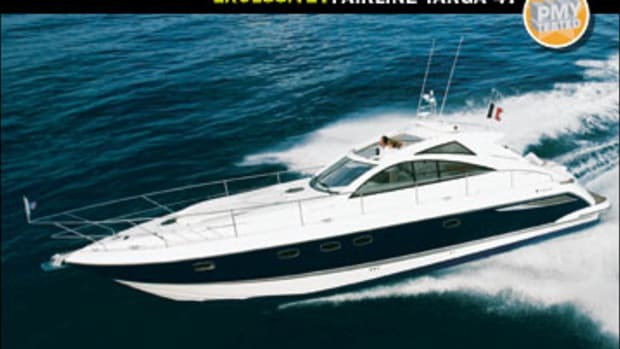 The top-of-the-line Squadron 74 is sure to please Fairline owners wishing to step up to a larger vessel and may woo away a few owners of competitive brands as well. No wonder, for the 74 not only does just about everything well, she does it with a cool self confidence that is prototypically English.